Year-Round Indoor Fun at Sachs Rec Center! 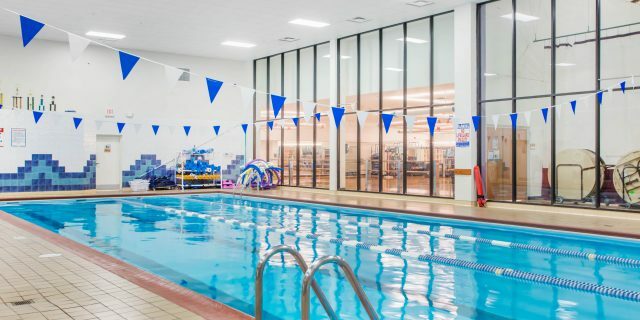 Lap swimming at our indoor pool is the perfect place to build your strength and stamina and improve cardiovascular performance! Swimming also can serve as an important cross-training exercise. The 20-yard, four-lane pool is available for lap swim use during all operating hours (M-F, 5A-9P; Sa/Su, 7A-5P). During aqua exercise classes and private swim lessons, one or two lanes will be designated for lap swim users. Participation in lap swim is for all members and guests 16 years of age or older. During COHO swim team season only one lap lane is available during their practice times. Children 12 and under must be supervised by an adult for open gym. All indoor track users must be 13 years of age or above, a Fitness Center member or enrolled in a Park District class. Passes may be shared between family and friends. Children under age 13 are not allowed to accompany adults on the track. All open gym participants and/or indoor track users must check in at the front reception desk prior to entering. A valid membership card, valid (open gym and/or indoor track) pass or daily admission fee must be presented. As proof of payment, all non-members are required to wear a wristband at all times while participating in open gym and/or while using the track. Proper attire including closed toe, non-marking, athletic shoes must be worn. Food and beverages other than water are not allowed on the gym floors. Food and beverages other than water are not allowed on the track. Teaching private lessons, conducting team practices, or instruction are not permitted during open gym sessions nor on the indoor track. Fitness Center members may participate in open gym and/or may use the track during all scheduled, age-appropriate, open gym sessions at no additional cost. Non-members may pay a daily usage fee. The Recreation Staff reserves the right to determine court usage and court play during open gym sessions.